Ammira due dei palazzi costruiti dal re Ludwig II di Baviera in questo tour privato di un giorno intero da Monaco. 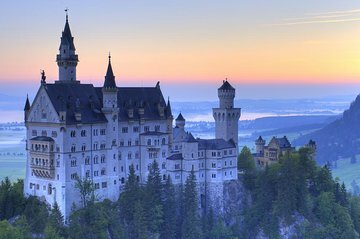 Fuggi sulle colline bavaresi di Füssen per vedere il castello di Neuschwanstein, l'ispirazione per il film della Disney "La bella addormentata". Salta la fila e goditi un tour a piedi di questa famosa dimora delle fiabe. Inoltre, vedi il castello di Hohenschwangau, la casa d'infanzia del re Ludwig. Poi, goditi una passeggiata intorno al pittoresco Lago Alpsee di Hohenschwangau o visita il vicino Palazzo Linderhof, ispirato al Palazzo di Versailles. Ritiro e riconsegna dell'hotel e ammissione a tutti i castelli inclusi. Combina l'ingresso al castello salta fila con soste addizionali facoltative alla Wies Church o per il pranzo. Il tour del castello reale di un'intera giornata inizia con un pick-up in hotel al mattino, seguito da un viaggio in auto in direzione sud-ovest, da Monaco alle colline bavaresi di Füssen, in un autobus con aria condizionata. Lungo il percorso, fai una sosta nella famosa Wies Church, una chiesa ovale in stile rococò a Steingaden, se lo desideri. Arrivo a Hohenschwangau in tempo per il pranzo (a proprie spese), poi fare un tour privato a piedi guidato del castello di Hohenschwangau, un maestoso palazzo gotico che fu la casa d'infanzia del re Ludovico II di Baviera. La tappa successiva è una delle destinazioni turistiche più popolari di tutta la Germania: il castello di Neuschwanstein, un palazzo del XIX secolo in stile rinascimentale situato in cima ad una collina scoscesa sopra il villaggio di Hohenschwangau. Questo splendido palazzo da favola è stato l'ispirazione per la Bella Addormentata della Disney ed è uno dei castelli e dei palazzi più popolari d'Europa, attirando 1,4 milioni di visitatori ogni anno. Evita le lunghe code in genere per entrare e goderti un tour a piedi privato di questo capolavoro medievale. Esplora stanze come la Sala di Minstrel, la Sala del Trono Bizantino e molte altre. Scopri l'architetto del castello, il re Ludovico II, e visita le terrazze, i giardini e i giardini esterni. Infine, scegli tra una passeggiata intorno al pittoresco Lago Alpsee o prosegui con l'autobus per un tour a piedi del Palazzo Linderhof, a circa un'ora di distanza a Ettal. Linderhof è stato ispirato dalle visite di re Ludwig al Palazzo di Versailles in Francia. È il più piccolo dei tre palazzi costruiti dal re e l'unico che ha vissuto per vedere completato. Anche così, il palazzo e il parco circostante sono una delle formazioni più artistiche e stilisticamente complesse del 19 ° secolo - e uno spettacolo da vedere. Il tour termina con un viaggio di ritorno a Monaco. Do not take this tour-it is mislabeled as it is not private nor guided. Our driver picked us up at 9AM and then did not say one word for the entire two hour drive out to the castles. We did not get any information about the countryside we were seeing or any comments until we arrived. He then showed us where the restroom was located and went to get our tickets for entry. He gave us the tickets and left us on our own until we were to meet him at 4:45 for the return trip. We were lost trying to find our way up to the castle whereas he could have easily stayed with us and guided the way. One then has to make the way back down, buy a bus ticket and then be bussed up to the second castle. Again, no guide was with us. When we met up with him at his appointed time, he again offered no comments on the entire drive back. He was an excellent driver but was not a guide. The castle was great but there is a lot of repair work going on on one end. There are lots and lots of steps so be prepared. When I planned my trip to Germany this was at the top of my list and it did not disappoint. This tour was amazing and made even better by Lars! He was friendly yet professional and shared his enviably knowledge of not only the castles but Munich with us. Nothing was too much trouble and he went out of his way to ensure we had the best time, including lending us gloves! Highly recommended. I can't say enough about this tour! It was the best tour of my European trip! My tour guide, Stephen was amazing and customized my tour with a short stop in Oberammergau. On the drive he enlightened me with the life story of King Ludwig II. He was very knowledgeable of the area and it's history. His English was excellent. This was not a cheap tour but the individual attention made it worth every penny. Our driver drove us to Neuschwanstein, and on our way we stopped close to a lake to get out and stretch. It was described in the website that there would be PRIVATE tours of Neuschwanstein and Hohenschwangau Castles, but instead we had to wait in lines to enter with group tours. Also, we never got to do a 90 minute stroll around the scenic Lake Alpsee. Our driver was cordial and nice, but he didn't tell us very much about the history and of the people around the areas, and of the castles. Excellent trip to the Royal Castles. We had a private car and driver. He picked us up at our hotel in Munich, gave a wonderful tour en route to the castles, qued up to retrieve our tickets and advised us of the best way to see both castles. My husband and I are active so we decided to walk to each. The walking is definitely not for everyone. The tours were satisfactory, as tours go. The castles are amazing...Neuschwanstein is definitely something to see. You do not see the entire castle. Only a few of the rooms as it was never fully completed. A must is to hike up the hill to the trestle bridge and view Neuschwanstein Castle from the bridge. It's amazing. After both castle tours our driver met us at the designated location and we headed back to Munich. A different route home which was very informative as well. Stephen was pleasant and courteous. He met us at our hotel as planned. He talked about the castles and some of the lesser known facts about the King Ludwig II while en route. The tour of the countryside was very pleasant. Our tickets for the castle tours were ready for us when we got there. Stephen very carefully recommended the best routes for our group to get from one location to another. We had plenty of time to explore in addition to the tour. Most of the day did not go as planned or described, but overall it was fun. There is a lot more walking (up and down the hill) than was described, but the castles are worth it! Our guide was great in getting our tickets for us and we did not have to stand in line. This was NOT as billed. First of all, unlike the description--we were charged extra for admission to the castles. This is distinctly different than the tour description. We did have a hotel pick-up with a private van. Our driver, Stephan, was very knowledgable. He did not offer us a tour of the Wieskirche--instead, we went to a different church instead. We were not offered the opportunity to see Linderhof. Also, we did not have a private tour of the castles--not of Hohenschwangau, and not of Neuchwanstein. This is also not what it says in the description. What was done was pre-booking of the timed tours--and better not be even 5 minutes late , or you will miss your 30 minute tour of the castle. 30 minutes for each castle. We we told to walk up to Hohenschwangau 20 minute uphill climb--this was the non-strenuous walk--past Lake Alpsee--beautiful. Get to Hohenschwangau, where there are timed entry ticket stalls that read your ticket and let you in only at the time of your ticket. You are herded thru the castle and allowed to see about 6 rooms over 2-3 floors. We were then told to hoof back down and get on a packed, crowded bus with passengers unsafely jammed on--to ride up past the MArienbrucke for another 10 minute uphill climb to the bridge where there is picture-taking frenzy--jostling for space with hundred of other tourists to take fairy-tale pictures of the fairy tale castle. It was pretty cool. The bus ride was 1.8 Euros, and well worth it--walk down about 20 minutes, past another scenic view point where you can see views of BOTH castles--also pretty cool. continue down to the castle courtyard, where the number of your tour is flashed on an electronic billboard, You have only 5 minutes once your tour group number is called--tours are let in 60 people at a time--every 5 minutes. If you miss you spot--it's tough luck for you. There are A LOT of steps--over 300 stairs--up and down the castle, to see furniture and rooms which Ludwig never got to use. Then pile back out and walk downhill--we took a horse carriage ride downhill 3Euros each and rode down, where Stephan our guide was there to meet us. It was a long, tiring day--not suitable for elderly or those with inability to walk or climb. Not for those with heart or respiratory conditions--The setting of the castles in the mutinies was tremendous. But the tour was not as billed. We did not have a private tour--this was a driver and facilitator--and we paid more than Viator quoted us. But I'm glad we went--much better than trying to do it on our own. But for the price--I expected more. Loved our guide and the whole experience! You won't regret this tour!